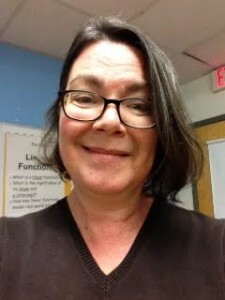 Liz Cox is currently the Director of Common Ground High School, an environmental studies charter high school located in New Haven, Connecticut. Since Liz took on the role of Director, she has demonstrated that the local environment can be a powerful context for challenging, authentic, and meaningful learning, and she has promoted environmental learning to break down barriers between the school and the community. She has demonstrated that environmental issues and the urban environment in particular, are a powerful tool for interdisciplinary learning and have a role in every subject area. In 2012, Liz received a Presidential Innovation Award for Excellence in Environmental Education from the White House Council on Environmental Quality, in partnership with the U.S. Environmental Protection Agency. In 2012-2013, Common Ground High school was named a federal Green Ribbon School. Before teaching, Liz worked in management positions for non-profit health care concerns. Liz is also very involved with food security initiatives in New Haven; she managed Loaves and Fishes Food Pantry for 10 years, served on the Emergency Food Council, and is currently Vice President of the Board of the Downtown Evening Soup Kitchen. Liz earned her BA in English from the University of the South, and her MBA from Cornell University. She also has an MS and English teaching certification from Southern Connecticut State University.